After the runaway success of the first release of Tovey’s Symphony in D in the Toccata Classics project to record all of Tovey’s major works, this second CD brings three more Tovey works – one a premiere recording, another a first recording since 1937. 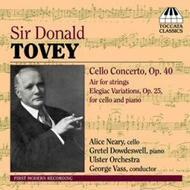 Tovey’s Cello Concerto, Op. 40 – almost an hour in length – was written for his friend Pablo Casals; it is joined here by the delightful Air for string orchestra, and the noble Elegiac Variations for cello and piano. As with the first CD, this second is conducted by George Vass, whose ‘firm direction’ (International Record Review) made such a success of the Tovey Symphony. Alice Neary – ‘a player of the highest calibre […] a player of rare gifts’ ( The Times ) – was the winner of the 1998 Pierre Fournier Award, and was awarded major prizes in the 2001 Leonard Rose International Cello Competition, USA.